With half of this summer’s biggest titles already in bookstores, we’re turning our attention to fall, which is shaping up to be action-packed and full of suspense. Anytime you get new books starring Mitch Rapp, Harry Bosch, James Bond, Jack Reacher, and Stephanie Plum over the course of just a couple months, you know it’s going to be a good time. 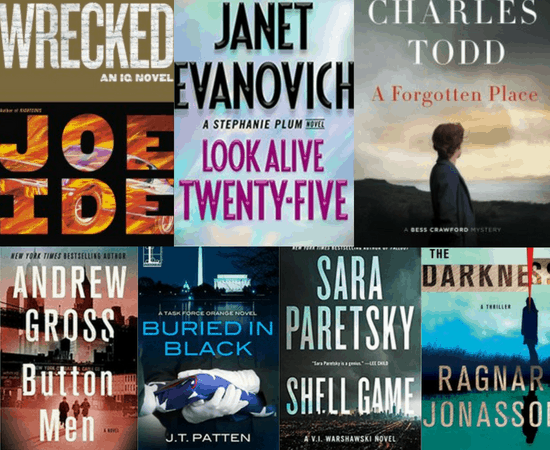 Check out all the must-read thrillers coming out this fall below. “The #1 New York Times bestselling series returns with Mitch Rapp racing to prevent Russia’s gravely ill leader from starting a full-scale war with NATO. “LAPD Detective Renée Ballard teams up with Harry Bosch in the new work of fiction from #1 NYT bestselling author Michael Connelly. “A spy is dead. A legend is born. This is how it all began. The explosive prequel to Casino Royale, from bestselling author Anthony Horowitz. “The #1 New York Times-bestselling master of international intrigue takes readers into the bleeding-edge world of technological espionage in a propulsive thriller that feels chillingly real. “Family secrets come back to haunt Jack Reacher in this electrifying thriller from #1 New York Times bestselling author Lee Child, “a superb craftsman of suspense” (Entertainment Weekly). “New York Times bestselling author John Grisham returns to Clanton, Mississippi, to tell the story of an unthinkable murder and the bizarre trial that follows it, in this powerful new legal thriller. “Stephanie Plum faces the toughest puzzle of her career in the twenty-fifth entry in Janet Evanovich’s #1 New York Times-bestselling series. “Set against the assassination of JFK, a poignant and evocative crime novel that centers on a desperate cat-and-mouse chase across 1960s America—a story of unexpected connections, daring possibilities, and the hope of second chances from the Edgar Award-winning author of The Long and Faraway Gone. “In a blistering scenario almost too close to the headlines, former Brigadier General A.J. Tata delivers a chillingly authentic glimpse of tomorrow’s wars—and the anonymous hackers who hold the fate of the world at their fingertips . . .
“The New York Times bestselling author of Outlaw Platoon makes his fiction debut with this electrifying military thriller—a gripping tale of action, suspense, and international intrigue that introduces a compelling new hero, Eric Steele. “Lethal assassin Victor lands in the middle of a Guatemalan cartel war in the latest nonstop thriller from the international bestselling author of The Final Hour. “The new novel in Craig Johnson’s beloved New York Timesbestselling Longmire series. “The fall of the Iranian government presents unexpected danger to President Jack Ryan in the latest entry in the #1New York Times-bestselling Tom Clancy series. “From the author of the “compelling” (Star Tribune, Minneapolis) and critically acclaimed Everything You Want Me to Be, a riveting and suspenseful thriller about the mysterious disappearance of a boy and his stunning return ten years later. “Introducing a remarkable new character from #1 New York Times bestseller David Baldacci: Atlee Pine, an FBI agent with special skills assigned to the remote wilds of the western United States who must confront a new monster . . . and an old nightmare. “When this relentless rogue FBI agent comes knocking, her adversaries will have to answer—with their lives—in the latest thrilling Jane Hawk novel by the #1 New York Timesbestselling author of The Silent Corner. “Only Juan Cabrillo and the crew of the Oregon stand between two warring moguls and global havoc in this thrilling suspense novel in Clive Cussler’s #1 New York Times bestselling series. “Police chief Jesse Stone returns in the newest novel in Robert B. Parker’s New York Times–bestselling series and his newest case hits right at the heart of the Paradise police force. Jesse Stone is back on the job after a stint in rehab, and the road to recovery is immediately made bumpy by a series of disturbing and apparently racially motivated crimes, beginning with the murder of an African American woman. Then, Jesse’s own deputy Alisha–the first black woman hired by the Paradise police force–becomes the target of a sophisticated frame-up. As he and his team work tirelessly to unravel the truth, he has to wonder if this is just one part of an even grander plot, one with an endgame more destructive than any of them can imagine. “Robert B. Parker’s iconic and irresistible PI Sunny Randall is back, and the stakes are higher than ever as she races to protect her ex-husband–and his Mafia family–from the vengeful plan of a mysterious rival. “Sheriff Joanna Brady’s best intentions to stay on maternity leave take a hit when a serial homicide case rocks Cochise County, dragging her into a far-reaching investigation to bring down a relentless killer in this chilling tale of suspense from New York Times bestselling author J. A. Jance. “Though the Great War has ended, Bess Crawford finds herself caught in deadly circumstances on a remote Welsh headland in this tenth entry from the acclaimed New York Times bestselling author. Their officer, Captain Williams, writes to describe their despair and his own at trying to save his men. Bess feels compelled to look into their situation, but the Army and the clinic can do nothing. Requesting leave, she quietly travels to Wales, and that bleak coal mining village, but she is too late. “New York Times bestselling author P. J. Tracy is back with the most addictive installment in her award-winning mystery series. “Following up The One Man and The Saboteur, Gross’s next historical thriller brings to life the drama of the birth of organized crime in 1930s New York City from the tale of one family. “Isaiah Quintabe–IQ for short–has never been more successful or felt more alone. A series of high-profile wins in his hometown of East Long Beach have made him so notorious that he can hardly go to the corner store without being recognized. Dodson, once his sidekick, is now his full-fledged partner, hell-bent on giving IQ’s PI business some real legitimacy: a Facebook page, and IQ’s promise to stop accepting Christmas sweaters and carpet cleanings in exchange for PI services. “From Peter Blauner, the writer Dennis Lehane calls “one of the most consistently bracing and interesting voices in American crime literature,” comes a new thriller about a lone young cop on the trail of a powerful killer determined not just to stop her, but to make her pay. “New York Times bestselling author James Swallow begins his espionage thriller series with Nomad featuring British desk jockey intelligence operative turned active agent. Marc Dane is an MI6 field agent at home behind a computer screen, one step away from the action. But when a brutal attack on his team leaves Dane the only survivor―and with the shocking knowledge that there are traitors inside MI6―he’s forced into the front line. Matters spiral out of control when the evidence points toward Dane as the perpetrator of the attack. Accused of betraying his country, he must race against time to clear his name. With nowhere to turn to for help and no one left to trust, Marc is forced to rely on the elusive Rubicon group and their operative Lucy Keyes. Ex-US Army, Lucy also knows what it’s like to be an outsider, and she’s got the skills that Dane needs. “After two years of living on cheap beer and little else in a bitterly cold tiny cabin outside an abandoned, crumbling mansion, young programmers Shawn Eagle and Billy Stafford have created something that could make them rich: a revolutionary computer they name Eagle Logic. “Nora Roberts, the #1 New York Times bestselling author of the epic Year One returns with Of Blood and Bone, a new tale of terror and magic in a brand new world. “Leningrad, Russia, 1968. Alexander Karpenko is no ordinary child, and from an early age, it is clear he is destined to lead his countrymen. But when his father is assassinated by the KGB for defying the state, he and his mother will have to escape from Russia if they hope to survive. At the docks, they are confronted with an irreversible choice: should they board a container ship bound for America, or Great Britain? Alexander leaves that choice to the toss of a coin . . . In a single moment, a double twist decides Alexander’s future. During an epic tale of fate and fortune, spanning two continents and thirty years, we follow his triumphs and defeats as he struggles as an immigrant to conquer his new world. As this unique story unfolds, Alexander comes to realize where his destiny lies and accepts that he must face the past he left behind in Russia. “When we last saw Laurie Moran, she had recently become engaged to her show’s former host, Alex Buckley. Since then, the two have been happily planning a summer wedding and honeymoon, preparing for Alex’s confirmation to a federal judicial appointment, and searching for the perfect New York City home for their new life together. “Special agent James Cronley Jr. finds that fighting both ex-Nazis and the Soviet NKGB can lead to strange bedfellows, in the dramatic new Clandestine Operations novel about the birth of the CIA and the Cold War. “The thrilling new novel featuring Jack West, Jr. from New York Times and #1 international bestselling author Matthew Reilly! Now, these dark forces are coming after Jack…in ruthless fashion. “Their son is gone. Deep down, they think they’re to blame.